Well, it is true. We have accomplished the minimum goal for this year. We have visited all stations, gave them a check-up and put them back in their holes. If everything goes as planned, they can now stay there and happily take data until their solar panels are buried in the snow and they will run out of power, which is not expected to happen soon. 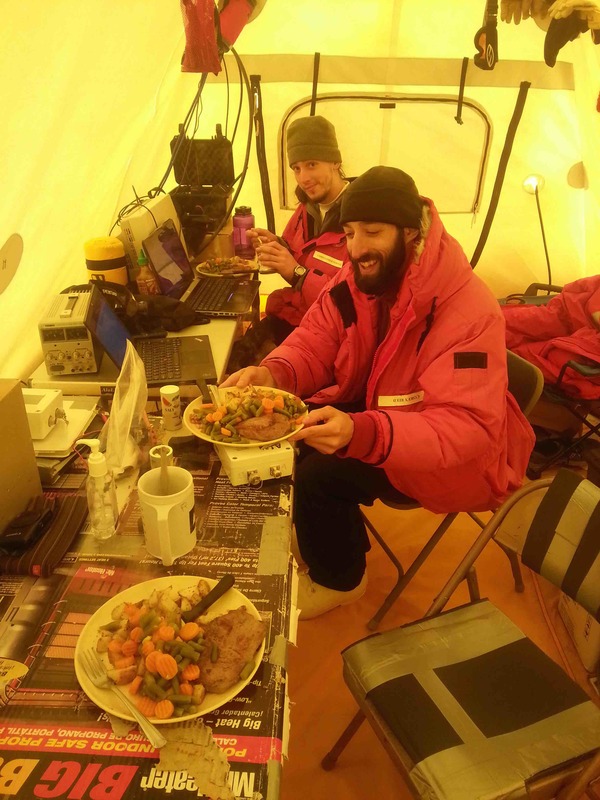 We would have not hoped to be this far by now already, but we have been powering through bad weather and have not been stopped by aching arms, legs and backs. This is why you don't have to pay scientists a lot, by the way. We just love what we do and do all of this without surcharges for dangerous environments, weekend works or night-time work. In any case, we have therefore now reached the extras. 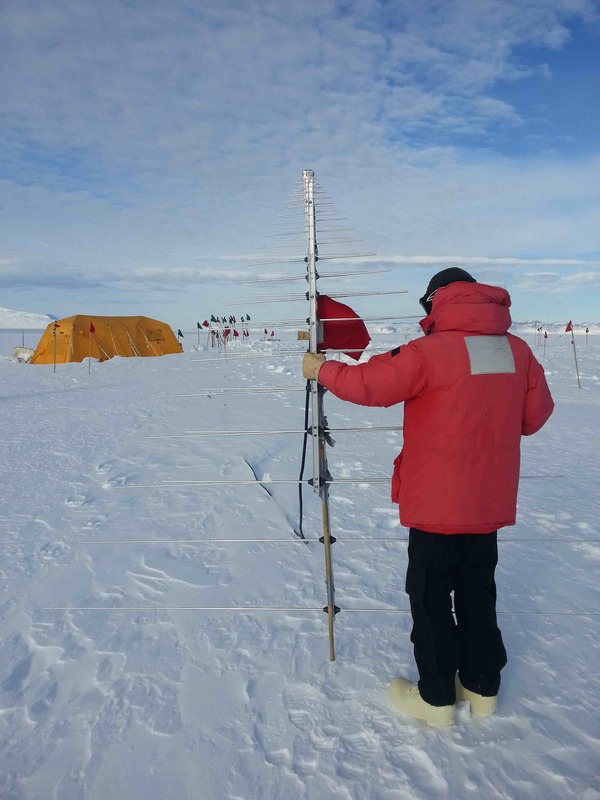 We want to study our ice and the radio environment. We started with the radio environment yesterday and that was already fun. As we know, the largest source of radio interference are humans. And who are the only humans currently in the vicinity of our experiment? We are. So, we started by turning of the generator. Generators are the most annoying radio noise source, for example whenever a helicopter lands our stations go crazy. But we of course wanted to look at the radio environment with our oscilloscope, which need power. So, we ran of a battery and used an inverter that gives you 110 V. It turns out that even buying the most radio quiet inverter also creates noise. So, we stuck all equipment in a little radio quite tent (a Faraday cage with conductive tent liner) from our colleagues from Taiwan and moved the antenna to more than 30 meters from our tent. Then a long endeavor of changing filters, attenuators and cables followed, which left us with the conclusion that our new antenna is just so sensitive, that it picks up on every little interference, we are making. Apart from the noise that we are creating there seems to be nothing going on out here, as expected. But it would be so much nicer, if we could prove this with a solid measurement. No giving up yet, today is another day and we will be getting there. Even, if we have to wrap everything in tin foil! Just kidding of course, we would never create so much waste out here. After all, all our waste has to be shipped all the way back to California. It turns out that New Zealand does not want the waste of the US antarctic program -- so literally every single piece is put on the boat back to California. Even the buckets from our bathroom tent, if I am not totally mistaken. Avoiding trash gets a totally new importance here and I have never been in a place in the US before, where so much consideration is put into recycling. The people from waste management at McMurdo (the "wasties") are doing a terrific job. 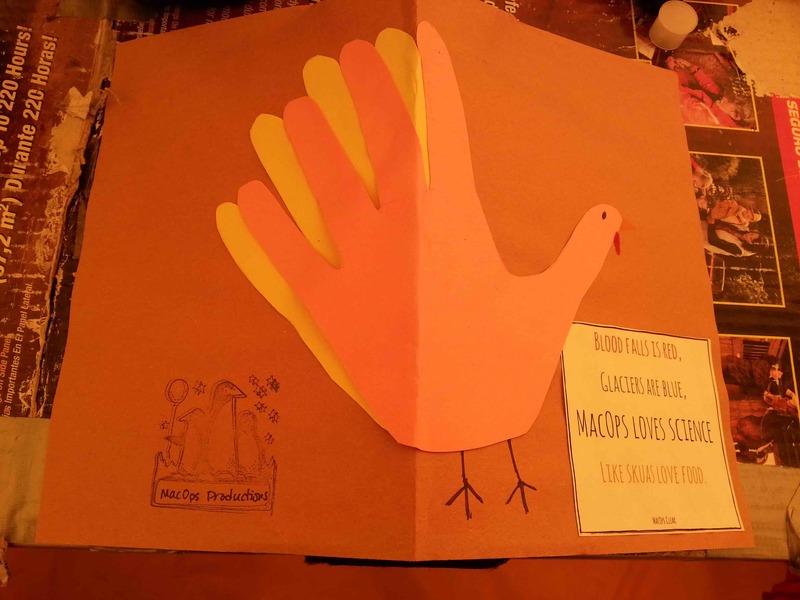 In this aspect, we id a great job on Thanksgiving dinner, because there weren't really any remains. We finished everything that we made. And for the first time in quite a while, we were so full, than no one could fit an additional chocolate bar after dinner. While the Thanksgiving Dinner has been a classic -- steak, vegetables and roasted potatoes -- not all our meals are classic. We take turns in cooking and whoever is not on cooking duty can make random suggestions, usually greeted with a long sigh and a shaking head. However, Chris is known to take on the challenge. So, Corey asked for Lasagne. Only challenge, we have no lasagne pasta, no tomatoes (in fact, we have no fresh vegetables) and only a very small oven. So, Chris took dehydrated pasta "Leonarda do Fettucini", Hamburger patties, pasta sauce, a pan and cheese and magically made something like a lasagne. We can fix everything it seems. 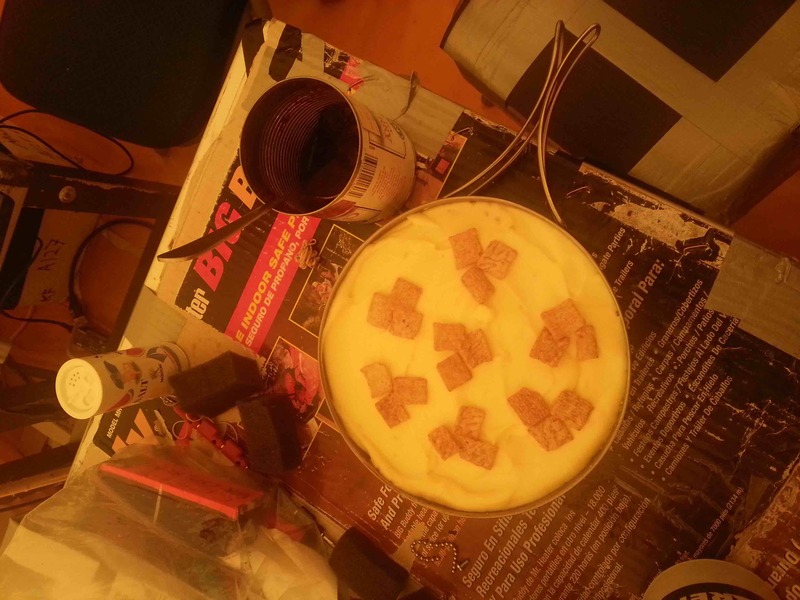 The next challenge was the no-bake cheesecake. One would think, that if you bought one of these packs, you really did not want to add anything yourself. However, this package requires adding of sugar and butter. (I can see butter since fat might go bad, but sugar, seriously?? Has sugar been getting so expensive that high fructose corn syrup is the only thing that one could afford??) Our problem: We have loads of butter, but we did not bring any sugar. Since we could not let Thanksgiving go by without cake, we substituted the sugar with a mixture of honey and cinnamon crunch breakfast cereal. Also that turned out great. The fact that we had to use our frying pan as cake form can only be considered as an aesthetic problem. we are ready to go! -- If we hadn't we would be certainly ready in an hour, when the rescue helicopter was flying overhead. If you don't make the check-in time every day, they will assume that something happened that made you not be able to call in, and they will start the rescue operation. So, if you would want to avoid being disturbed by a helicopter with pretty angry people during late breakfast, you better make sure that you call in on time. Which we did. Consequently, we start our days work -- by digging more holes! Wait, did the title not say that we have done enough digging? Well, for the ice studies we will have to dig more holes. Clearly the title of this blog has been a little premature.